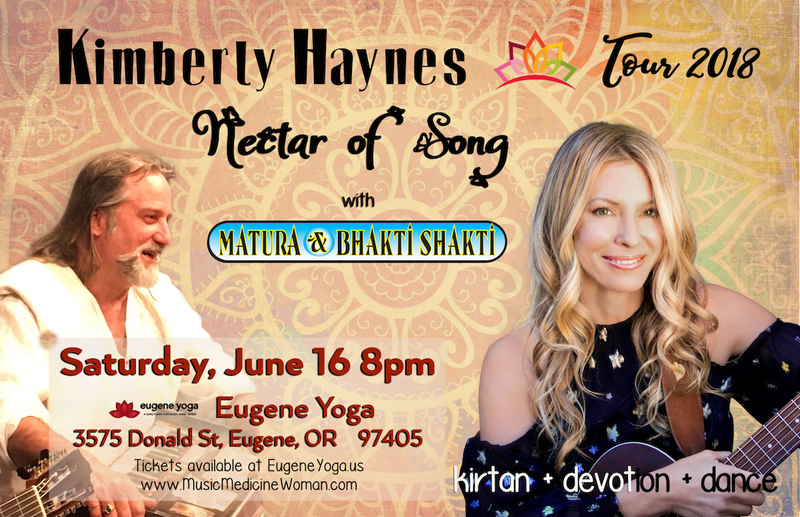 Kimberly Haynes’ Nectar of Song 2018 tour rolls into Eugene Oregon w Matura Seva & Bhakti Shakti. Bathe in the sublime and soothing sounds of the songs of Kimberly Haynes. Kim expresses her musical art in a variety of genres inlcuding sacred chant, world, folk, and dream pop. As a member of the human race, Kimberly is dedicated to supporting harmony on the planet through the medium of art and music. You will be swept away by her enrapturing sonic portals into the heart space, the masterful Vito Gregoli on guitars, flute and sitar, and the sound healing grooves of Christo Pellani. Celebrate, sing and dance with the devotional wisdom, heartfelt connections, and the uplifting high energy Kirtan of Matura and Bhakti Shakti, featuring masterful performances by guitarist Deva Priyo (Nicola Notaro of Gypsy Moon) co-founder with Jaya Lakshmi of the highly acclaimed world Trance band ‘Lost at Last’ and celebrated Tabla virtuoso Daniel Paul (Jai Uttal, Gina Sala), ,as well as vocalists Beloved and Heather Angelheart. Doors open at 7:30pm. Concert begins at 8:00pm.